Humor smiles and chuckles and sometimes laughs so loud in virtually every book of the Bible, so it's remarkable how readers manage to overlook it. It's also unfortunate. Humor graces biblical texts at so many levels that to miss the humor is to miss not only much of the emotional impact of the Bible, but much of its meaning. Illuminating Humor of the Bible shows how-and how much-comic elements contribute to understanding the most vital book in our culture. Biblical humor has been seriously underestimated. We have not begun to appreciate why humor winks with such unexpected frequency and understated significance from this revered text. It's time to shine a spotlight on scriptural wit to illuminate the ways humor refracts biblical meaning. Unveiled by the frank perspective of humor, Bible texts reveal implications that will surprise the most informed readers. The reader-response lamp of humor lights up dark corners of biblical significance inaccessible until now. Awareness of the irony and wit and satire and slapstick enables not just better readings, but better ways to read. Go where no Bible reader has gone before. Try eight fresh and relevant methods of reading the Bible better through the lens of its humor. Steve Walker is Professor of English at Brigham Young University, where he has taught The Bible as Literature for forty-seven years. He earned a PhD in literature at Harvard and studied at the Divinity School there. His twelve books include Christian Fantasy: Tolkien and Lewis (1980), Mourning with Those Who Mourn (1999), and Seven Ways of Looking at Susanna (1986). There is nothing here of slapstick or cheap stuff. Rather, this humor concerns the mocking of Jonah and the reversal of Esther. Such humor subverts commonplace assumptions about our ordered, controlled world. Walker is a good reader who shows us how much we have yet to learn about the text and how much we have yet to unlearn. Illuminating Humor of the Bible is a gift to the careful and caring reader. Walker's love for the Bible--not for the traditional, life-dampening interpretations so many foist upon the unsuspecting, but the actual biblical text--shines through on each page, living up to the title in every way. Walker sees the text with fresh, enthusiastic eyes that dare to have a twinkle in them. 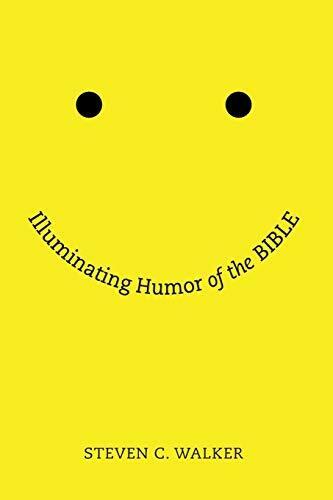 Many readers don't see humor in the Bible, often because they don't expect it or don't know how to look for it. . . . Walker's solid, often detailed treatment will reward those willing to explore by identifying where the humor is, how it works, and how it can surprise us with new insights about living.